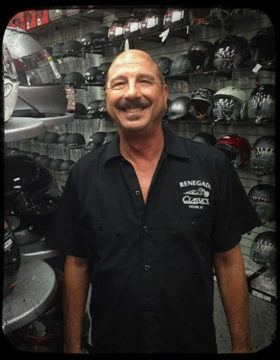 I’m Bob Cacolici, nicknamed the Helmet Master because of the number of bikers I have fitted with helmets of all sorts over the last … so many years. I’m a biker myself, I’ve been so most of my adult life. I ride to commute. When you come to the store, don’t be shy of asking guidance to choose the right helmet. Your head deserves protection. A well-fitted helmet protects your noggin’ and a poorly fitted helmet gives the appearance of protecting it… but won’t. Look for me, and we’ll look at your measurements and the shape of your skull, and we’ll try as many helmets as necessary to find you the exact right fit in the exact right style for you.